To help celebrate the sixth anniversary of ArenaNet MMORPG, Guild Wars 2, they are partnering with national bubble tea retailer, Kung Fu Tea. This is a month-long in-store and online promotion during September. Through the month, customers will be able to try the Elder Dragon Dreamy Delight (which is a Guild Wars twist on Kung Fu Tea’s Cocoa Cream Wow) as well as unlock Guild Wars 2 in-game content and claim daily prizes via the Kung Fu Tea app. Kung Fu Tea customers who link their Twitter, Instagram, or Facebook accounts through the Kung Fu Tea mobile app can claim unique in-game codes to download a dragon-themed character outfit, in addition to the Guild Wars 2 Heroic Edition. 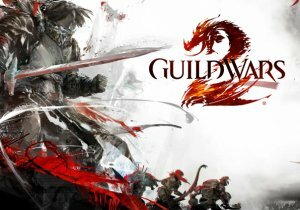 The Heroic Edition is not available at retail and expands upon the Guild Wars 2 game, offering a unique set of armor, an 18-slot inventory box, and 10 experience boosters to jump-start players’ adventures in the world of Tyria. Additionally, customers can enter daily for a chance to win a copy of the Guild Wars 2 Deluxe Collection by posting a photo of the new Elder Dragon Dreamy Delight drink with the hashtag #GW2xKFT. The Deluxe Collection comes with the game’s two expansions, Heart of Thorns andPath of Fire, an additional character slot, a max level boost, and more. Kung Fu Tea will highlight the daily sweepstakes offer via digital iPad and TV displays in over 150 U.S. stores. Kung Fu Tea will also drive excitement for the Elder Dragon Dreamy Delight via their website, email, social media, and influencer network. Customers can stop by any Kung Fu Tea location nationwide, starting on September 1st, 2018 to try the Elder Dragon Dreamy Delight.